Oregon has windswept Pacific coastline in abundance. Stand on one of its cliffs and you will feel the full force of the ocean breakers beneath you. It also has a distinctly primeval look about it, with its rugged mountains in the west and its dense forest of evergreen redwoods. Mount Hood, Oregon's highest point, ranks amongst the most prominent mountain peaks in the US. Perhaps one of Oregon's most awe-inspiring sights is Crater Lake, which has to be the bluest lake for miles around. It is certainly the deepest in the USA. The lake resides at the very center of the Crater Lake National Park, one of the first six of America's national parks to be set up. This state is also closely associated with the Oregon Trail, which was created by trappers and traders back in those exciting early pioneering days of the 19th century. It was originally only wide enough to be passable on foot or horseback. Nearly half a million settlers wended their way along this trail during its heyday. Today's travelers to Oregon tend to follow the Interstate I-80, which doesn't have quite the same romantic connotations. 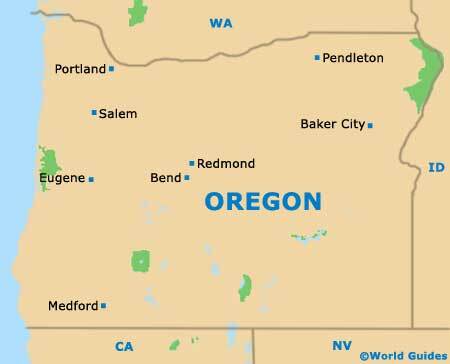 However, it does pass through roughly the same towns that the original pioneers would have seen, which isn't a bad way to get to know Oregon. Over the years, film directors have flocked to Oregon in their search for the perfect film location. Movies shot here include 'Free Willy', a heart-warming tale of a young boy's fishy adventures, and 'One Flew Over the Cuckoo's Nest'. Matt Groening, the creator of 'The Simpsons' hails from Portland, Oregon, too, hence the frequent references to the city in many of his distinctive cartoons. Portland, Oregon's 'City of Roses', is divided by the Willamette River. Home to countless parks and gardens, such as the famous spreading Washington Park, Portland is full of diverse and historic districts. Although Salem is the capital of Oregon state, many people tend to treat it like a day trip destination, rather than a place to holiday. However, hanging about for longer will reveal history, culture and trails along the Willamette River.